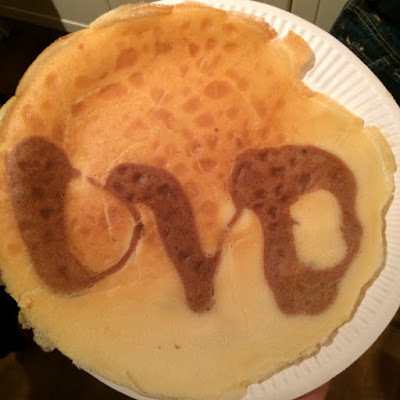 A personalised "DVD" pancake that was made for me this week. A culture is changed through its artists, argues Jonny Mellor, so Christians should step up to the plate (or down the staircase, as he suggests). There are few questions more pressing to a (young, especially) Christian than, "Can I miss the will of God for my life?" Andrew Wilson and Natalie Williams had a conversation about it. How did baptism change the world? Peter Leithart explains. If you want the next rucksack you buy to help kids in care, you should get one from Madlug. I'm not the only one who has been wondering whether naming storms makes them seem more frequent. BBC Magazine has been doing some actual research rather than just asking the question out loud every time a new storm name is mentioned.